It is a New Year’s tradition that people make resolutions. The idea of a resolution itself is a refreshing concept. You are consciously making a decision to better your life in some form or way. Far and away the most common resolution is to lose weight. Unfortunately, many people will fail to actualize this goal because they have poorly planned or designed their strategy for obtaining their goal. I mentioned earlier that a resolution is a conscious decision. However, much of our actions are actually at the mercy of our unconscious. It doesn’t matter if we’re making a moral decision or a financial decision; our behaviors are often guided by our unconscious perceptions that are processed in our brains. One sense above all holds more weight than any other, and that is our vision. In this post I want to shed light on how our visual sense guides our decisions in everyday life, and how sometimes our vision can lead us astray from our goals -like losing weight and even saving money. I’ll even offer solutions as to how you can neurologically design a better plan for accomplishing your goals this New Year. Our eyes are responsible for the gathering of photons and light, but all that information comes together in our brains. We don’t see with our eyes, we see with our brains. Vision is our most dominant sense. Visual processes in the human brain actually account for half of our brain’s resources. Although we are highly specialized in visual perception we can still make mistakes. Shockingly, these tables are the exact same length. Truth. Let’s look at the table example above. 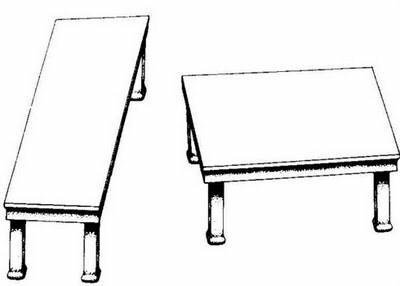 It would appear that the table on the left is longer than the table on the right, but guess what, it’s not. They are equal length. The funny thing is that even after I tell you that this is an illusion it’s impossible for you visually perceive the tables as equal size. Its visual illusions like this that can lead us to make poor decisions in our everyday lives. While growing up many of us were scolded for not clearing our plates while eating dinner – some of us were even guilt tripped to a far away land where children were starving. This habit of clearing our plates is heavily dominated by our visual perception, and wrongfully so. Today, many consumers equate value to the amount of food you’re given for the money you paid for the meal. I call this the “super size” conundrum, because it’s a great to get the most bang for your buck, but does your stomach really need all that food? The answer is no. Your stomach does not need all that food. Nutritionists long ago proved that a little bit of food will go a long way. One study suggested that a burrito could be the size of a bar of Dove soap while still being able to fulfill nutritional needs. So why do most of us consume “burritos as big as our heads” in their entirety? There are two reasons. 1. Eating is enjoyable and 2. For the stomach to communicate that it’s full to the brain takes about 15 minutes, and as a result while eating we’re guided more by our vision than by actual physiological signals. This is especially true for anyone who has eaten so much they gave themselves a stomach ache. 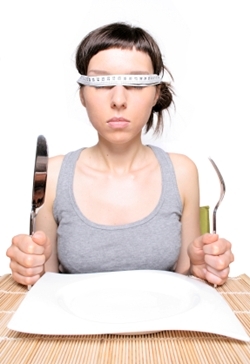 In nutritional study conducted in 2001, those who ate blindfolded ate 22% less food. In 2001 Dr. Yvonne Linne conducted a study to see how much people would eat if they couldn’t see their plates. The participants were split into two groups and given equal plates of delicious food. Group one was instructed to eat until they were full. Group two was given the same instructions except group two was blindfolded. The end result was that group without vision, group two, consumed 22% less food than group one. Eating less food was achieved because group two had to rely on their own internal physiological cues for being full over the visual illusion of “clearing the plate” that guided group one. Unfortunately eating while blindfolded is frowned upon in public. So what can you do to reduce your food intake to a reasonable yet still healthy amount? It’s easy. Use smaller plates and glasses. If vision is still going to guide how much we eat just have the plate size work in your favor. It may seem like a big reduction at first but over time your stomach will adjust to a more reasonable serving of food. The same also applies for beverages as well. 8 ounces is a perfect serving size for a drink, but in a world 64oz Big Gulps (4 lbs of liquid! ), 8 ounces seems like drop of water when it’s really not. 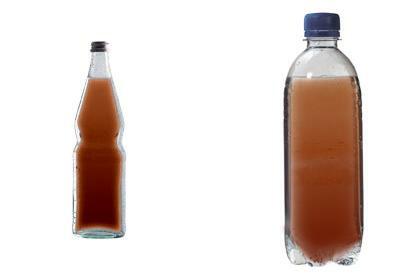 On the left you have a 12 oz bottle of soda, and on the right you have today's more common 20oz bottle of soda. The 20oz bottle of soda was actually devleoped with the idea in mind that people would drink less soda because of it's size. Sadly people didn't drink less soda, they just chugged 20 oz and got fatter. The extra 8oz of soda could acually account for 10% of your daily caloric intake. Eating slowly will also help because you need time for your stomach to say “hey brain, stop eating. I’m full.” We live in a fast paced culture and eating slowly may not make a whole lot of sense, but it’s important to eat a slow pace. Just the other day I had to grab lunch on the go. I chose to eat a small Spicy Chicken value meal from Wendy’s (my favorite). Using the stopwatch function on my phone I timed myself to see how long it took me to eat my entire meal. My time: 4:56. Way too fast. When I can, I distract myself at lunch while reading a book, a newspaper, or a friend’s blog to stretch the time while I’m eating. I also take deep breaths between going back for more food and I try to attune to my body to pick up on the “I’m full signal”. Interestingly enough our visual perception also plays a big role in how much we can spend at a grocery store. Just like how we base how much we eat off our plate size, we can get sucked into the same trap with shopping carts. One such study conducted by Martin Lindstrom compared two groups of shoppers. Group one shopped using shopping carts and group two shopped using hand baskets. The end result was that the shopping cart group, group one, purchased 31% more than the hand basket group. Whether we’re clearing a plate of filling a shopping cart our unconscious vision plays a pretty unique role guiding our behavior. Here are some tips that might help you save money: 1. Don’t shop hungry 2. Use a hand basket instead of a shopping cart 3. Make a list 4. Break your shopping routine – do this by switching up the time of day you shop, where you park, and even what door you enter. Breaking your usual unconscious rhythm while performing a common task will actually help you focus on the subtitles of the task at hand. Happy New Year, and best of luck to you on those resolutions!